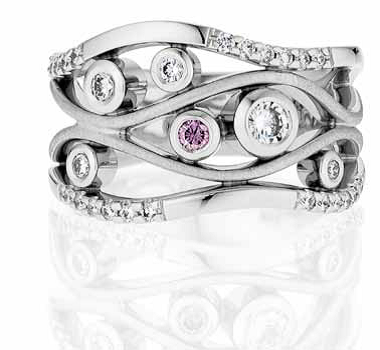 Fact: Diamonds are rare, precious and coveted the world over. Here’s another, lesser-known fact: the skill of diamond setting, specifically pave and micro pave settings is so rare that only two Australian women have ever been accepted into the prestigious Alexandre school for optical diamond setting – a school that is not only a world-leader for teaching these very specific techniques but requires prospective students to complete a one week audition and exam to be accepted. Only ten percent of students who apply are accepted into the course. Jodi Penfold is one of the chosen ones: a jeweller, an Aussie and a woman who is now amongst the exclusive few to hold the certification as rare as the diamonds themselves. Over-achieving is not a new concept to Jodi. Passionate about jewels from a young age, she set her heart on becoming a master jeweller, and started her apprenticeship straight from year 12 training under both an Australian jeweller and a German goldsmith. In her first year the determined 19-year-old set up a workshop from home, which became her first business. She then won a biennial scholarship to train as a gemmologist ranking third in Australia. In 2002 a chance encounter with a manager of a pearl farm saw her take a contract in Broome, and a one-month placement turned into a love affair with the region that is the inspiration not only for her Jewels of the Kimberley brand but also the designs. Broome soon became home, and in 2005 at just 24, Jodi opened Jewels of the Kimberley and has since added a host of awards and accolades to her already long list of achievements. But her achievements are not what set her apart. Working almost exclusively with Australian resources, stones and metals, Jodi’s creations have a uniquely Australian feel contrasting delicate pearls with rugged precious stones, much like the Australian landscape. Her unique vision and design perspective has driven the success of her business – now flourishing with a team of nine and has resonated with clients and jewellery lovers the world over. With her acceptance into the Alexandre school Jodi will broaden her already bursting skill set, taking her talent to the next level. The three-month course is lead by industry giant, Alexandre Sidorov who has not only taught the world’s best diamond setters but has also developed the tools essential to the craft, that are used by jewellers worldwide. 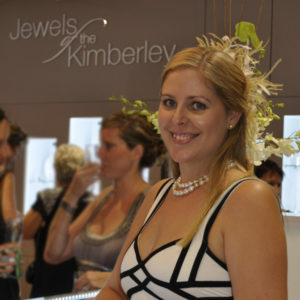 To say there are big things on the horizon for Jewels of the Kimberley is an understatement. With these newfound skills set to positively influence her designs, Jodi will be bringing her creations into a new design sphere – one that Australia is ready for. And, as she imparts her wisdom onto her apprentice, Hannah, Jodi will also begin to create the legacy of Jewels of the Kimberley being the gold standard of highly skilled Australian jewellers.